Summer vegetables are beginning to make an appearance in the local markets. This eggplant and feta salad is a gluten-free vegetable dish that can be enjoyed all season long. 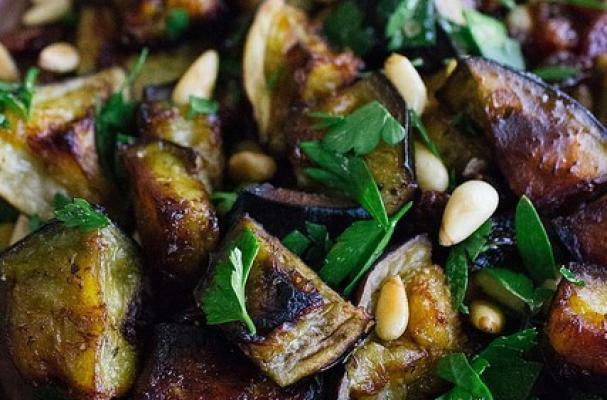 Cubes of eggplant are sauteed with garlic, tomatoes, and herbs. Once the mixture has cooled, walnuts, fresh parsley and feta are added. You can serve this salad on its own or stuff it into a gluten-free pita. In a large skillet, heat oil. Saute eggplants, onion and garlic til slightly softened, about 5 minutes. Add tomatoes, tomato paste, oregano, thyme and vinegar. Cook until bubbly and mixture thickens slightly, about 10 minutes. Remove from heat and stir in capers, walnuts, olives and parsley. Let cool completely and gently toss with feta cheese. Add salt and pepper to taste. Stuff each pita half with eggplant salad.